Classic Copenhagen Cycle Chic. 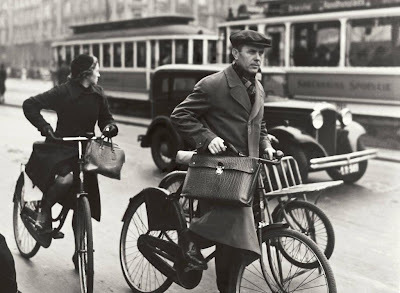 This is a Danish politician Aksel Larsen [1897-1972] on his bicycle in 1938. A classy Copenhagen woman is behind him. If you don't focus on the car in the background, this photo could have been taken yesterday. Photo copyright - The Danish Workers' Museum in Copenhagen. And thanks to John for this classic tourism poster from, coincedentally, 1938. 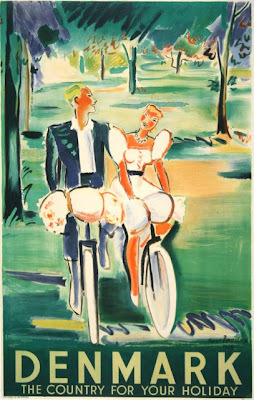 Hans Bendix did a number of these tourism poster featuring the bicycle both pre and post-war. Here are some other classics we've posted about before. Hans Bendix did the one on the right. Thank you for sharing this. As an American, it is pleasing to see politicians such as the late Mr. Larsen commuting by bicycle and sharing an experience with the citizens they serve. I recall a few weeks back, you mentioned that you pass a leader of a political party while she rides her cargo bike, taking her children to school. Very nice as well. Sightings such as these would be quite an anomaly in America where most politicians of any clout, even in urban areas, travel by chauffeured SUV.